The Jetta nameplate dates to 1979, a compact sedan that has been Volkswagen’s U.S. bestseller almost every year since. Along with the Golf hatchback (nee: Rabbit), the Jetta made its debut in 1979, as Volkswagen continued efforts to widen its product portfolio and wean itself from total dependence on the Beetle. 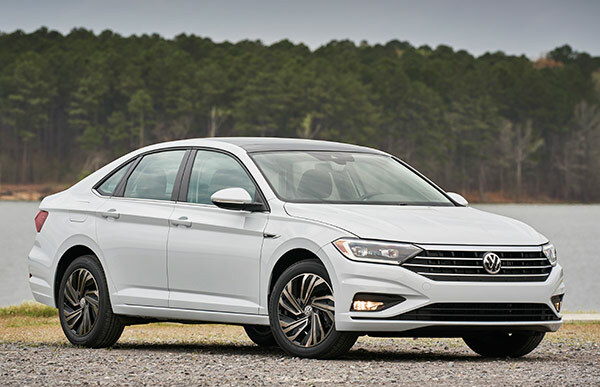 Now here’s a new Jetta, generation seven, and it will be surprising if the new car doesn’t sustain its bestseller status, probably even increasing its current sales volume. New applies to what we see: redesigned sheetmetal front to rear. But the more significant element of new applies to the foundations. The new skin surrounds Volkswagen’s front-drive MQB architecture, the same structure that’s supported the hatchback Golf since 2015. The benefits of this update are higher chassis rigidity, an incremental increase in wheelbase, and a roomier interior, particularly in the rear cabin. On the other hand, VW has discontinued the multilink rear suspension of the previous generation, employing a beam axle in the new car, undoubtedly a cost-saving measure. Powertrain elements are familiar. At launch the only engine continues to be a turbocharged 1.4-liter four, rated for 147 horsepower and 184 pound-feet of torque. There are two transmission choices: a six-speed manual, and an eight-speed automatic. EPA fuel economy ratings with either transmission hit the 40 mpg highway mark:, 30 mpg City, 40 Highway, 34 Combined. Manual transmissions are increasingly rare, and in the Jetta it’s offered only in the base model. The automatic is an option in the base car, standard on higher trim levels. The 2019 Jetta is offered in five trim levels, S ($18,545), SE ($22,155), R-Line ($22,995), SEL, and the top-of-the-line SEL Premium ($26,945). The base price for the S trim is a little lower than the outgoing Jetta, though the other trim levels run a bit higher than corresponding models from the previous generation. Volkswagen characterizes its basic Jetta warranty as one of the industry’s best: six years, 72,000 miles, bumper to bumper. Volkswagen isn’t known for taking chances with its styling, and the new Jetta is hard to perceive as daring. On the other hand, it can be perceived as new and contemporary, as well as upscale by compact sedan standards. The wraparound grille, which is siamesed into the LED headlights (standard on all trims) lends a more aggressive look to the front end and the strong character line extending from the front wheel wells to the LED taillights accentuates the new Jetta’s longer (by 1.3 inches) wheelbase. Overall length increases only fractionally, so the net effect is to reduce the car’s front and rear overhangs, which in turn contributes to a more athletic look, as does the stepper slope of the rear roofline. Volkswagen’s interior design team has given the inner Jetta a more premium look with new fabrics, new colors, attractive stitching, and driver-adjustable amibient lighting in 10 different colors. The nicely bolstered bucket seats offer the option of ventilation and heating, and in the SEL Premium model they’re clad in leather. Another welcome option: a heated steering wheel. The top two trim levels include Volkswagen’s Digital Cockpit, which allows the drive to set up the instrument display for preferred data, the enlarged center bin can swallow an iPad, and, new to Volkswagen, there’s a 400-watt Beats audio system. The longer wheelbase contributes to adult-size rear seat legroom, (although like any compact sedan the center rear is suitable only for child seats), and at 14 cubic feet the trunk is generous by segment standards. Like other German cars, the Jetta’s resume includes extensive time on the autobahn, the most demanding high speed development crucible on the planet. Cars designed for highways with no speed limits exude a distinctive sense of solidity and dynamic certainty, something that was true of the previous Jetta and truer still of the new one. The Jetta’s new architecture provides a sturdy foundation for suspension tuning that has that autobahn feel, firm enough to minimize body roll in cornering, with just enough shock absorber damping to take the edge off gnarly pavement. Engine power continues to be modest. The Jetta gets across intersections with respectable zeal when the light turns green, thanks to turbocharged engine torque. But there’s not much punch at higher speeds, for maneuvers such as passing on a two-lane highway. However, the action of the new eight-speed automatic is smooth and responsive, downshifting readily when the driver calls for more power. And the start/stop feature (limited to the automatic transmission) is smoother than most. The Jetta’s steering (2.8 turns lock-to-lock) provides a satisfying sense of connection between car and driver, transient responses are prompt, and based on a brief day of preview driving on North Carolina back roads the braking performance should stand up to very hard use without any hint of fade. Whether the reversion to a simple beam axle in the rear tangibly limits the Jetta’s capabilities would require more challenging roads and more vigorous driving. The dynamic takeaway from the press preview was positive. In addition to its satisfying Teutonic road manners, the Jetta’s other strong suit is reduced interior noise level. Reduced wind noise, reduced road noise, reduced engine noise. City streets, back road, or freeway, this is an exceptionally quiet car by compact sedan standards. The new Jetta is roomy, quiet, smooth, and dynamically competent in the way that distinguishes German cars from those developed elsewhere. It’s about 50 horsepower short of sport sedan status, but otherwise satisfying to drive. If more performance is important, stand by for the GLI edition, due next spring, with the 220-hp turbo four that propels the hatchback GTI.